An advertising campaign focusing on how Miracle-Gro stimulates roots to grow and thrive, even in unusual environments. Miracle-Gro stimulates root production and health. The larger the plant's root system, the stronger and bigger the plant can become growing more spectacular flowers, bigger vegetables, lush foliage and stronger trees and shrubs! Current advertisements show the root system of a plant treated with Miracle-Gro where it grew so much, the roots took the shape of the pot they were planted in. This unfortunately only allowed the plant to grow to a certain point before it stops. 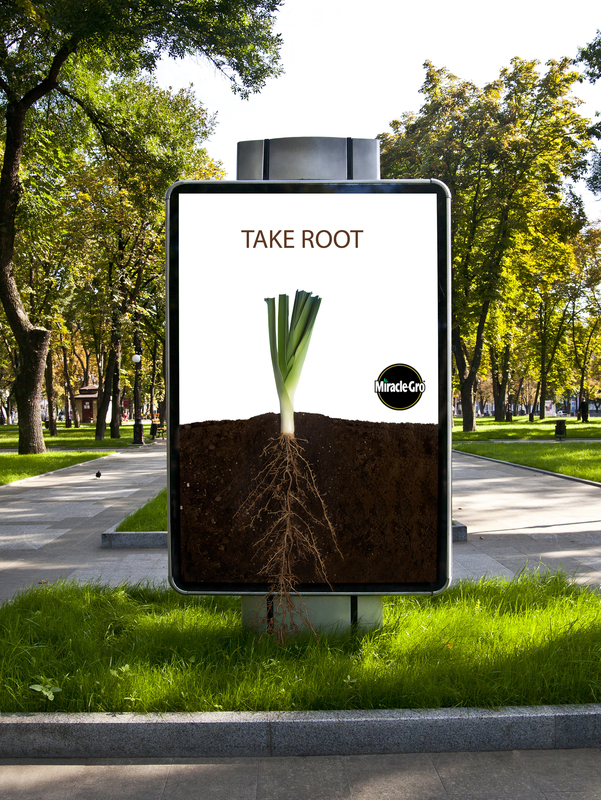 The new mock-up takes this idea one step further with the leek being planted in an open billboard, allowing the roots to continue to grow out of the billboard and right into the ground.